When Tim DiFrancesco, a Boston raised kid who grew up on a farm in rural New England, was hired as the head Lakers strength coach back in 2011, he was quick to recognize the irony of it. 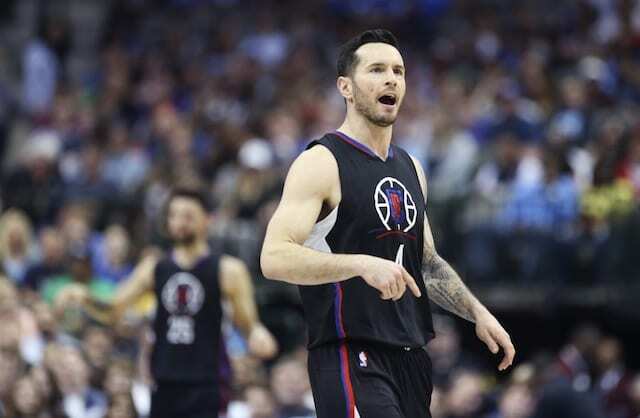 With six seasons under his belt, DiFrancesco has resigned from his position with the Lakers to pursue the next phase in his life, which most importantly includes spending more time with his wife, and his 11-month old daughter, Averie. He recently penned an open letter to Lakers Nation, thanking everyone for their support. We sat down with DiFrancesco to ask him about his past six years with the Lakers, his favorite Kobe Bryant stories, anecdotes about the real work ethic of the Lakers young core, the most impressive thing he saw during his six seasons, and what’s next on his horizon. Q: You spent most of your time with the Lakers in the training room and in the weight room, what are some of your favorite memories? I think one of the moments, is probably when I first met Kobe, and I just went to shake his hand. So, I put my hand out (to shake it), and he just pushed my arm out of the way! And, as Kobe could and did say…He said get that [expletive] out of here and said, let’s get some work done! And so, that was my intro to Kobe. And then, a few players on the team say, ‘Prove it! Prove it that you’re one of us!’ So, I had sweatpants on with shorts underneath, so I dropped the sweatpants down and sat five times on the leprechaun head, and the team kind of went crazy, so I think from there I was welcomed in and allowed into Lakers family. And then, just generally speaking in the weight room, the atmosphere, and the camaraderie of the guys. When that environment gets really up and running and guys feed off each other, and there’s music playing and all that stuff, that environment is a really special, unique environment…and that young core is a group of guys that I had a lot of fun developing in that environment for the last 2-3 years. Q: I was going to ask you the best Kobe story, that we wouldn’t know, but you kind of already gave me one with that story of Kobe pushing your arm out of the way when you went to shake it! I think another one that stands out with him…He had come from a tough loss in Memphis, I think going into Chicago, and when it’s all said and done, we’re probably not getting much sleep, and getting in at 3 AM, and we might be getting back and shutting off and unwinding at 4 AM. So it’s 4:15 AM, 4:30 AM, somewhere in there, and I’m drifting off to sleep, and I see a text coming from my phone. If I’m not mistaken, I think he was actually playing some classic piano ballad on the hotel piano, as he was waiting for me to enter the gym and get our workout on, from about 4:30 – 5:30AM, so that one definitely stands out. Yeah, I was thinking, there was no way that a hotel would’ve brought somebody to be playing at this time….But of course, I looked to my left corner and of course I should have known (it was Kobe). 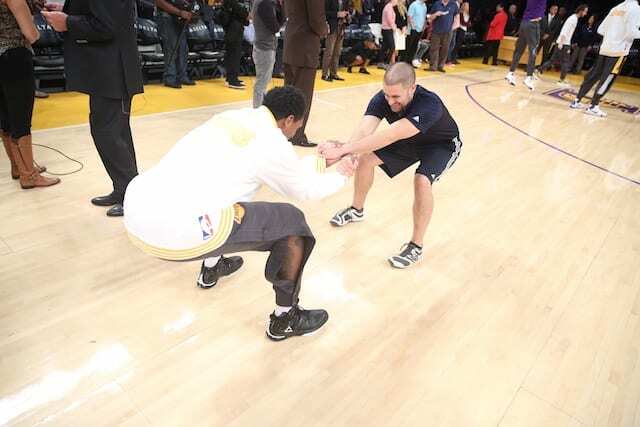 Q: I know that during at least one point while you were with the Lakers, you kept a session tracker for how much guys worked out with you, and I remember Ryan Kelly was one of those guys that was always at the top of that list. So, who was at the top of your session tracker for the last season? For the last season, it was Ivica Zubac and Brandon (Ingram) were neck and neck. Now, I do have to qualify that had Jose (Calderon) finished the season with us, then he probably would have been ahead of those two guys, so Jose was sort of the honorary captain of that board. Jose shattered everybody’s record, even Ryan Kelly’s. That was the cool thing, having time to be around those great vets like Jose Calderon and then going back to the first year and being able to see my first experience to see what a real pro does at this level. Guys like Derek Fisher, Pau Gasol, obviously Kobe, Steve Nash and Metta World Peace. I think those guys, they helped me recognize the standard and accountability that these young guys needed to have. So, very last practice of potentially his long and very successful career and one of his routines throughout all the times I was with him was that immediately after practice, he would always do a 15 minute cooldown and flexibility. So, it’s the final practice of the season, and I look out to the weight room and I see him go through his same routine, which to me, he had every reason in the world to be like, look I just finished my last practice of my career more than likely, so I’m just going to take a shower and head home, but no. That, to me was one of the most precious things. Literally, this guy is saying by his actions, this is what it means to be a pro, and that was really, really impressive and I’ll always remember watching that. Q: On your website, the first thing that pops up is a photo of you and Brandon Ingram, and you just told me how hard of a worker he is along with Zubac. I’m just curious what it’s like to work with him because he seems like a guy that is incredibly committed to his craft and has a great work ethic. First off, that couldn’t be more accurate and second of all, I was really thinking about the quiet confidence that he displays in everything that he does. I was able to see that in action shortly after we drafted him. There was a period of time where, as an organization it was decided that myself and Nina (Hsieh), the assistant trainer who is outstanding at what she does, would go to Kinston, North Carolina, where he was going to be for a little bit of time, before he got situated back in LA. He and his father were there to show me the gym he would have access to, and then I was going to try to make sure everything was all in line, before I had to fly back to L.A. and be with other players, so I wanted to get him through at least one workout. Right off the bat, this kid showed me. I put a workout together, that I wanted to be realistic, but also challenging to see how he would handle it, and I don’t think he said three words during the workout, but the amazing part was just in his facial expressions, and his approach to every time I explained an exercise…What I mean is, I’ve had guys that are like, ‘That’s what we’re doing? or No way! And I’m like yeah, that’s just the warmup and they think it’s the whole workout, so there’s moments where you have guys that are new to the weight room and you have an eye roll here or whatever, and this kid (Ingram) was like, ‘What’s next, can we do more?’ This was where the body, the mannerisms, the stuff that I was getting from his body language, was all can we do more? He was really, really impressive to me, all year long. This kid, he’s going to be something really special to work with, because when somebody approaches it like that at 19, the possibilities are endless. Q: In your letter to Lakers Nation on your website, you also thank Steve Nash for bringing that professionalism to his craft. And, I think a lot of Lakers fans might not look back on those years as the fondest, with everything Nash went through with the injuries. But, what do fans not understand about that time? I think the thing most important to understand, is that nobody wanted that to go extremely well, more than him, and nobody that I saw put more towards trying to make that happen on a daily basis and did every single thing possible, exhausted every possible option, turned over every stone, to figure out how he could get to a point where he could be on the court and doing what he felt he was capable of at that time. 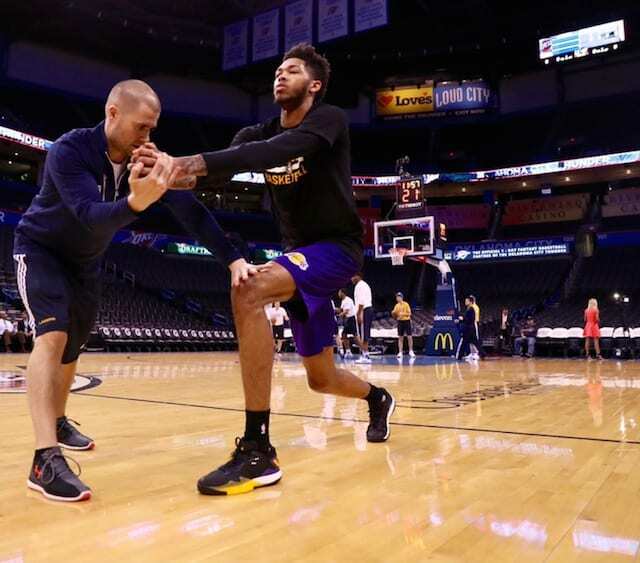 But, from what I saw in the process, was a guy that was the first one in the gym, a guy that was a consummate professional during that time working with young players, trying to share with them what had helped him, and then also showing by example what it meant to be faced with challenges and just fight through. It didn’t pan out…when you have that many miles on the body and you have certain injuries, sometimes the body doesn’t cooperate with what you want to happen, but he did beyond what I think any organization could ask of a person to do to make everything as right as they could, and that was something that I’ll always stick with me, in how to operate and how to approach your craft in this profession. I mean with Steve, it was like he was the oldest guy on the team, but he was the guy that was on me when we would get into a new city and say what time are we working out, first time in the morning and all of that stuff. But, unfortunately it didn’t translate into what his body was going through. 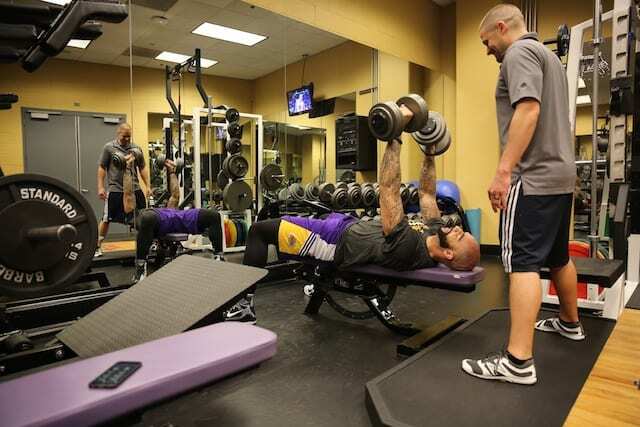 Q: Any advice for Gunnar Peterson, the Lakers new director of strength and endurance training? Gunnar has been around pro guys for along time, and I think that’s the number one thing that this job is about, is connecting with the individuals. The number one priority that I put on myself when I took this was: however long I get to do this, I want the people that I connect with, whether it’s staff or the players… that they would feel like there was a connection there…to be a value and have a respect and a level of trust that comes from the time that we got to be together, so I think, to me, that’s what the job is all about, and I know that the Lakers are in great hands when it comes to that, because they have great people in position that handle the players, and they are working so hard to build a culture that is revolved around those connections. Q: What’s next for Tim DiFrancesco? Moving back to New England, as I brought out in the letter, first and foremost, I’m just really, really, really excited to give the time and energy to my family and primarily my amazing and very patient and miracle wife and our daughter Averie. My wife was really just so incredibly supportive and patient and trusting of me before this Lakers stuff came up, she was there for me, along for all the adventures… including being in Bakersfield and the NBA D-League and all the stuff that led to this happening, and just being so supportive and incredibly loving and there for me through the grind of the NBA season. And, from a business and career standpoint, I’m super excited to be able to have extra bandwith and time to be able to improve TD Athletes Edge, which as many Lakers fans are aware of, that’s sort of my platform, to be able to help others to gain their edge and I think everybody is always looking for an edge and I know that one of the things I know about myself is that I love helping people solve that puzzle. This is a platform that allows me to be able to do that, and my brother Scott and I, we’ve put out a brand new podcast Edge Factor Radio, which is on iTunes and Stitcher and Google Play, so that’s going to be another way for us to interact and speak with our audience. The bottom line is for me to be able to reach as many people as I possibly can, and this gives me a chance to do that and really dive into different possibilities of edge training. Everyone always says you should have a mentor, well that’s great if you happen to cross paths with somebody that’s truly great at being a mentor and they end up doing that for you, but not everyone has that luxury, so I want to be able to have a way to do that for whoever I can and that’s kind of my way of feeling like I had a great opportunity and I want to give as much of that back as I possibly can…so, the insider mentorship is something that we are offering currently and the best way to get more info on that is to either email info@tdathletesedge.com or a great way to get info is to direct message me on Instagram and I will respond to every single message! Q: One piece of advice for those looking to live a healthy lifestyle, that doesn’t involve how much money they make or access to a bunch of equipment? Consider sleep a skill, consider sleep as important as nutrition as important as training. Sleep is something you need to practice, make consistent effort to get good at it, and you should take it just as seriously as you take your workouts, your training, by far your most overlooked bang for your buck to be more healthy.